Omar Jadwat, director of the ACLU's Immigrants' Rights Project, carries court documents after a news conference outside a federal courthouse in Greenbelt, Md., Oct. 16, 2017. The White House is reacting furiously to a federal judge blocking President Donald Trump's latest executive order that would have banned entry to travelers from several countries beginning Wednesday. "Today’s dangerously flawed district court order undercuts the president’s efforts to keep the American people safe and enforce minimum security standards for entry into the United States," the White House said in a statement issued Tuesday. The White House response came shortly after Judge Derrick Watson ruled against restrictions on travelers from six countries the Trump administration said could not provide enough information to meet U.S. security standards. On Wednesday, a judge in Maryland joined the suit, arguing that Trump's own words led to the decision to block the ban. U.S. District Judge Theodore Chuang heard arguments Tuesday brought by advocacy groups led by the International Refugee Assistance Project, which argued that the current travel order still amounts to a Muslim ban, and that it exceeds presidential authority. The travel order would have barred to various degrees travelers from Chad, Iran, Libya, Somalia, Syria and Yemen. Watson's temporary restraining order does not interfere with restrictions on North Korea and Venezuela. FILE - Omar Jadwat, center, director of the ACLU's Immigrants' Rights Project, speaks at a news conference outside a federal courthouse in Greenbelt, Md. The Justice Department "will vigorously defend the president’s lawful action," the White House said, contending its proclamation restricting travel was issued after an extensive worldwide security review. The Justice Department called the ruling incorrect and said it will appeal the decision "in an expeditious manner." Homeland Security Acting Secretary Elaine Duke said: "While we will comply with any lawful judicial order, we look forward to prevailing in this matter upon appeal." The new travel order "suffers from precisely the same maladies as its predecessor: it lacks sufficient findings that the entry of more than 150 million nationals from six specified countries would be 'detrimental to the United States,'" Judge Watson wrote in his opinion. The White House argues that its restrictions "are vital to ensuring that foreign nations comply with the minimum security standards required for the integrity of our immigration system and the security of our nation." Officials in the White House expressed confidence further judicial review will uphold the president’s action. Consular officials have been told to resume "regular processing of visas" for people from Chad, Iran, Libya, Somalia, Syria and Yemen, a State Department official said. The suit on which Judge Watson ruled on Tuesday was filed by the state of Hawaii, the Muslim Association of Hawaii and various individuals. "This is the third time Hawaii has gone to court to stop President Trump from issuing a travel ban that discriminates against people based on their nation of origin or religion," said Hawaii Attorney General Doug Chin. "Today is another victory for the rule of law." President Donald Trump speaks to reporters upon his return to the White House in Washington. 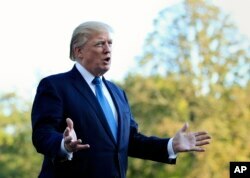 Trump said in the September 24 proclamation announcing the new order: "As president, I must act to protect the security and interests of the United States and its people. The restrictions announced are tough and tailored, and they send a message to foreign governments that they must work with us to enhance security." The new ban dropped Sudan from the list, but it added Chad, Venezuela and North Korea to the original six Muslim-majority countries. And in each case, the directive varies. For Syria and North Korea, all immigrants and visitors are banned. The same is true of Iran, except that students are exempted. Immigrants and people on business or tourist visas are blocked from Chad, Libya and Yemen. 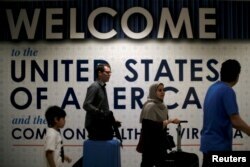 Visitors from Somalia may come to the United States while immigrants are barred. In the case of Venezuela, only certain government officials are disallowed. The September proclamation provides varying rationales for the new strictures, thought to be more defensible in court than something more sweeping. "North Korea does not cooperate with the United States government in any respect and fails to satisfy all information-sharing requirements," the presidential declaration said. Venezuela was cited for failing to cooperate "in verifying whether its citizens pose national security or public safety threats." U.S. officials also said the Caracas government does not willingly receive Venezuelans deported by the United States. Chad, a "valuable and important" counter-terrorism partner, failed to share terrorism-related and other public safety information, the proclamation said. Chad has responded by pulling troops from the fight against Boko Haram in Niger.